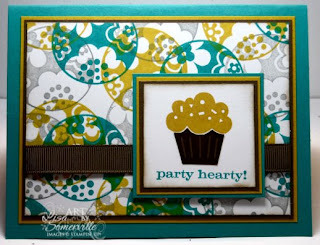 It's a preview day of NEW product from the 2009/2010 Stampin' Up! Idea Book & Catalog! For the outside of my card, I used the new Circle Circus set and the Depth of Field Technique to create a fun background for my birthday card. Two of the inks I used are the new Ink Colors - Crushed Curry and Bermuda Bay. The Birthday Cake and sentiment are from Party Hearty. The image was stamped in Crushed Curry, then I stamped the liner in Soft Suede (another new In Color) on Soft Suede card stock, and paper pieced it onto my stamped image. I used a SAMJ and Bermuda Bay ink for the sentiment. The ribbon is the new Soft Suede Polka Dot Grosgrain - which is reversible! 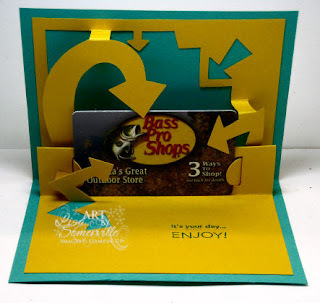 For the inside of the card, I used the new Pop Up Look Here Die - perfect for gift cards! The die was cut from the new Crushed Curry card stock. I used a SAMJ to stamp the sentiment from On Your Birthday in Bermuda Bay. This is SO cool!!! Love the colors you put together! Very cute, love the background technique on the csrd front. I just cut out that stamp set last night so it's time to start stampin! I'm getting inspired, woo hoo. What a fun card, especially that inner gift card holding piece. I love those new in colors, can't wait to see more!